Shop Skis online at Skis.com for alpine skis, racing skis, cross country skis, kids skis, boots, bindings, or even snowboard equipment. Skis carries the best from K2, Salomon, Atomic, Rossignol, Under Armour, Ugg, The North Face, Coal, Burton, Leki, Nils, M. Miller, Marker and many more. 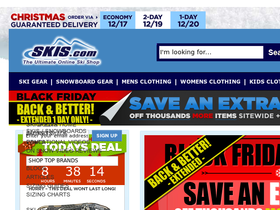 Save on your next purchase from Skis.com with Skis discounts, Skis coupons and Skis savings from 58coupons.com. Hurry on over to Skis.com to save up to 70% on select items during summer sale. Click link to get started. Enjoy free shipping on all 2011 orders over $99 or more from Skis.com. Click link to shop. Head on over to Skis.com to shop and pick up a free DVD ($20 value) with your purchase. Click link now. Enjoy 30% savings on already discounted clearance items at Skis.com. Follow this link to see the selection. Purchase any 2011 twin tip ski from Skis.com over $400 and get a FREE pair of Skull Candy Lowrider Headphones!